Product Description: Cobalt Flux's flagship product. Widely hailed as the finest home platform available! Comes ready to use with your Playstation(R) or Playstation 2(R) console! Does not include Dance Dance RevolutionTM software. * NEW: Durable, replaceable, laminated decal set. * Shatter-proof 1/8" lexan surface. * Solid 3/4" melamine baseboard. * Hand made and inspected under exacting conditions. * One super tough Cobalt Flux Dance Platform. * One platform control box, for unparalelled performance and protection. * Rubberized anti-slip material to keep your CF platform in place. * One Cobalt Flux platform care and maintenance manual. sorry for my stoopid post ......so can anyone here tell me what i can do so i can make my feet know where they are and are there any kinds of mods i can do to make my feet know where they are like putting bigger screws with bigger heads in the holes where the plexiglass goes in? will that work? You can probably cut out cardboard and make it thick enough so that when you put it under the X, O, Triangle, and Square buttons that they'll be raised up. Hey guys. I just bought a CF and after it came I realized that my smartjoy would not work for it. I just received my parallel adapter in the mail, instealed NTXpad 2.01 and tried to use the pad that is now installed in stepmania. The thing is, i go to map buttons and the pad freaks out and can only assign joy 1 12 and joy NR-up, and they sorta flash on and off, and set themselves very quickly. It looks like the pad is overly sensative for those two buttons. I cant seem to assign any other buttons on the pad...and I did press up + start and select for 3 seconds to see if it made a difference, and it doesnt. Anyone know what could be up with it? Any solutions? Loosen or tighten the screws on your CF. I tried both. It only picks up Joy ZR-Up and Joy 1 12 and I cant even tell which button either one of those is. No other arrow or button will work on the pad at all. Have you tried emailing CF or going on their forums as well. I like cheese and cheesecake. Yes, the Cobalt Flux can be played on PIU. 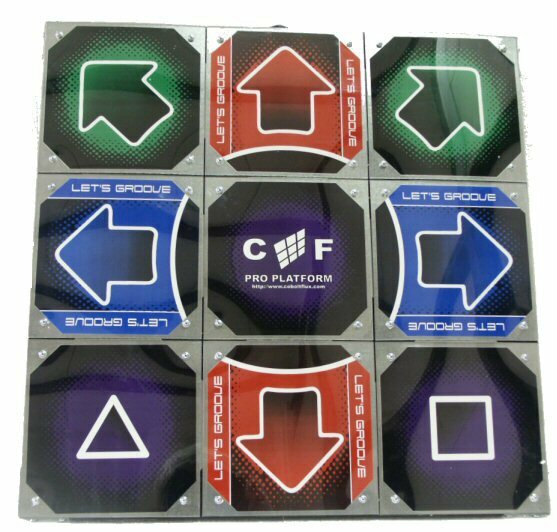 I think I read somewhere that it comes shipped with a piece of cardboard in between the middle sensor, so if you want to play PIU with your Cobalt Flux you have to take off the top of that sensor and take out the cardboard. Does anyone know if I can just buy the CF decals to replace any broken arrows on any other metal pads or do the CF decals only work for CF pads? So long as they fit the size required, I imagine they'd work on anything, since they're just 2 pieces of (lexan, plexiglass, whatever it is they use) and the pictures..
Are they bigger or smaller than any of the other pads' arrows? I was thinking of getting a pad, and would you guys recommend this pad? Best bang for the buck? if not.. which one would you recommend? I would wholeheartedly recommend the Cobalt Flux pad. I weigh 230 lbs., and I always play in shoes. I also play up to 10's. My pad and control box are 15 months old, and yet I can still AA So Deep Heavy and SDG many 7's and below. For a Good time, call 555-1212 and ask for Susan. For a Great time, call 555-3487 and ask for Mindy. For a Perfect time, call 555-6341 and ask for Stephanie. For a Marvelous time, call 555-6341 and ask for Stephanie's mom. Hey guys!Being as christmas is coming up i will have the opportunity to either get a cobalt flux or build two riptide pads with my parents paying for the materials. Which would you guys recommend? Which is more like the arcades? Thanx! anybody know if a CF would have less vibration for my poor downstairs neighbors than my RO ignition pad? "it is the broodwich. forged in darkness from wheat harvested in hell's half acre. baked by beelzebub. slathered with mayonnaise beaten from the evil eggs of dark chicken force-fed to dogs by the hands of a one eyed mad man. cheese boiled from the rancid teat of fanged cow. layered with 666 separate meats from an animal, which has maggots for blood." I'm doubting that it would, since the CF is pretty much a solid slab. I imagine that it would be worse. However, I've not tried the RO ignition, so I don't know. I imagine that hard pads like the CF will almost always be louder.